Air pollution is one of the biggest environmental issues of our time. According to the World Health Organisation (WHO), 90 percent of the world population breathes polluted air and seven million people die every year because of air pollution-related causes. India is one of the countries with worst air quality, nine out of ten most polluted cities in the world are in India. Some days, the air pollution reaches levels as high as 20 times over the safe limit set by WHO. There are many contributing factors to India's air pollution and a major one is the burning of residue straws from rice harvests, also called paddy straws. These paddy straws are the dry stalks that are left when the grain and the chaff are removed from the plant. 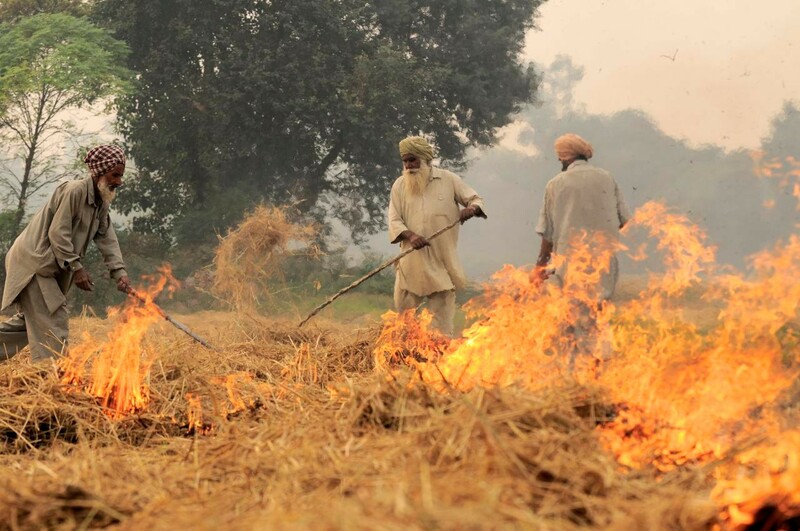 A study by the Harvard John A. Paulson School of Engineering and Applied Sciences (SEAS) shows that in peak burning season, almost half of air pollution in nearby areas can be attributed to straw burning. Paddy straw burning emits poisonous gasses like methane, sulphur oxide, andcarbon monoxide as well as a large number of particulate matters — solid and liquid particles suspended in air that are very hazardous to the health of living beings including humans. Up until the 1980's rice was harvested manually and the residue straw was collected to use as fodder or bedding for animals. However, with the introduction of combine harvesters in the '80s, more and more farmers started to rely on mechanised agriculture since compared to manual labour it was cheaper and faster. The problem with the combine harvester, however, is that it leaves a significant amount of straw in the field. This leftover straw makes sowing fresh crops impossible. Rice farmer's in India usually have 15 to 20 daysto prepare their fields for the sowing of the next crop — wheat — meaning they often need to get rid of the rice straws quickly. The quickest and cheapest way to do so is burning the leftovers. However, as I explained above, the cost of burning rice straws is much more than what's on the surface. Fortunately, the consequences of rice straw burning do not go unnoticed. Especially in the past decade, it has been a major topic of discussion within the context of air pollution. 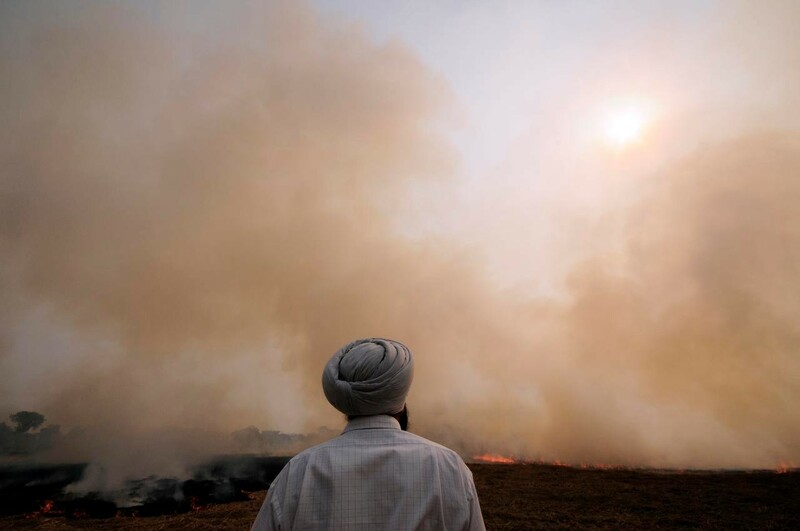 Crop burning is technically banned in India but the ban is not strictly enforced in many areas. Instead, India's general and local governments try to encourage farmers to stop burning rice straws by supporting them in finding alternative ways to get the straw off the field, as well as use it for the fields benefit. The Punjab government, for example, provides up to 80 percent subsidy to cooperative societies and farmer's groups and 50 percent to individual farmers to buy crop residue management machinery. One of these is a 'Happy Seeder': a machine that can be attached to a tractor that cuts rice straws, sows wheat into bare soil, and deposits the cut rice straws back onto the land as protective mulch. Using the machine protects the soil, provides nutrients for it and saves the farmer around 1,000 rupees per farm. Most recently, IKEA announced they are joining the fight for cleaner air in India. The company said their first course of action is going to be turning rice straws into a renewable raw material source for products. The first rice straw based prototypes are expected to be ready by the end of 2018 and IKEA aims to sell the products during 2019-2020 and gradually spread to more markets.